You may have noticed we released a new version of Jersey Watch early this week. We’re focused on making your website, registration, and communication easier to manage and improving the experience for visitors landing on your website. Over 50% of visits to your website come from phones, so we think mobile first! You’ll notice the new mobile version includes the slideshow (a common request we’ve received). Also, your most important content will show toward the top of the screen. 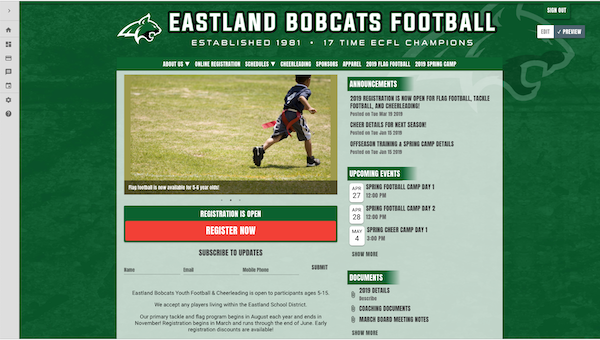 If you have registration programs open, a “Register Now” button automatically appears right below the slideshow. 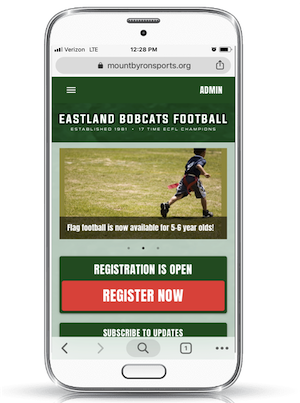 The mobile side menu is also much improved and allows visitors to more easily navigate to any page on your website from their phone or a tablet. Editing your website in place! You’ll notice you can edit most of your website just by going to your homepage now! The new version is much easier to edit, even if you and your fellow volunteers have no experience editing websites. The website is supposed to be big time saver for you, not an additional administrative item on your plate. We want you to be able to log in, make updates, log out, and move on with more important things. The less time editing the website the better! You can now toggle between “Edit” and “Preview” when you’re logged in on your Homepage. When viewing in “Edit”, simply click on the areas of the website you’d like to edit, and you can easily make changes. Edit your website from your homepage by toggling between “Edit” and “Preview”. 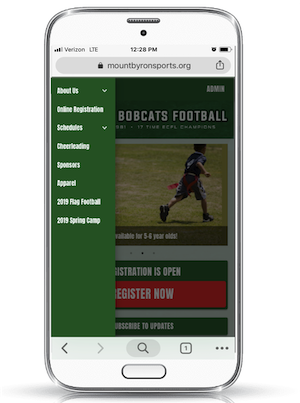 You can also easily access important features like Communication and Online Registration from the navigation menu on the left. The top menu is the first thing visitors see when they arrive on your site. We heard from a lot of customers that they’d like to see the “Website Powered by Jersey Watch” removed from the top menu – so we did it! The new menu is in your website color scheme, and will hover as users scroll down the page. We’ve included your most recent photos on the homepage of the website. These will appear in the bottom right on desktop, and at the bottom on a mobile device. Adding a few photo albums is a great way to make your website more aesthetically pleasing. Also, photos are a great way to promote your organization and give credibility to your teams when new players are thinking about registering. Don’t have any photos on your website yet? Make sure to add some action shots from last season – it’s super easy. We want to make sure you have plenty of space to recognize the businesses that sponsor your teams. Our new Sponsors widget will appear at the bottom of your homepage, and you have an improved page built in that is dedicated to your sponsors – try adding /sponsors to the end of your organization’s website address. 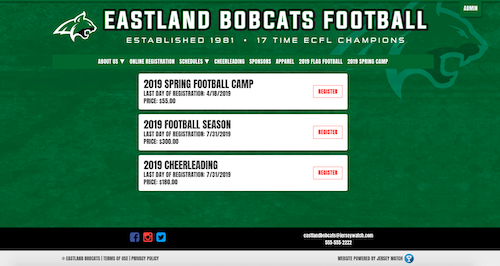 We redesigned the /registration page to make the experience for participants registering and paying online a bit smoother. We changed the name of the bank of files from “Downloads” to “Documents”. We noticed that a lot of website visitors were having a tough time finding important files, PDFs, forms, etc. because “Downloads” was a confusing word. The new name will be easier to understand, and is also less hidden on the new version. It can be accessed on the right side of the homepage without any hunting or clicking. Your social media buttons and contact information have been moved to the footer of the website – in line with most modern website experiences. They’re super easy to access for website visitors. We’re not done yet, there are some other changes we’re going to be working on over the next few months! We’ll be working on making your entire website “Edit in Place”. You’ll no longer have to bounce back and forth between the “backend” and “front end” of your website – you’ll just visit the page or section you want to edit, click, and make changes. We’ll also be re-working several aspects of the Scheduling feature to make it easier to create schedules, post event updates, and sort events on your website. Not a customer yet and looking to try it out? Head to www.jerseywatch.com to learn more or create an account.